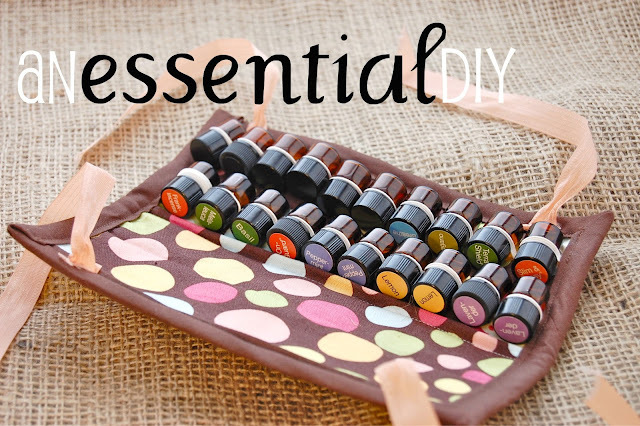 Thanks everyone for your emails, Yes I would love to make one for all of you that use essential oils, and though I'd LOVE to have that kind of ambition, I figured it's best to give you a DIY tutorial. I'm so glad though to hear about everyone that loves their oils! I figured out the easiest route (I think) to make this...It's infinitely easier than the first one I made, which had me pulling out my hair. So that's grand! IT WILL HOLD TWENTY-TWO BOTTLES! So first of all, you can buy 24 of the 5/8 dram bottles HERE for $8. 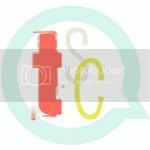 And to buy the bottle cap stickers (the labels), go HERE and then click SHOP FOR PRODUCTS and then type in search: BOTTLE CAP STICKERS. And go ahead a do some oil shopping if you're in the market. Or if you're going to buy the bottles, you can buy 154 blank white cap stickers HERE for under a dollar. 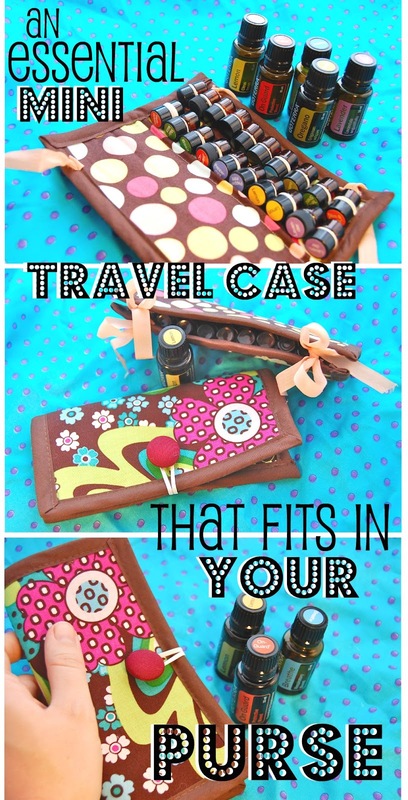 I figured that this travel case is worth it because I don't have to risk loosing my large oil bottles AND I won't have to cart them around either. (I've also been known to put stuff on top of my car and drive away...and it's always expensive stuff- never a water bottle or anything). 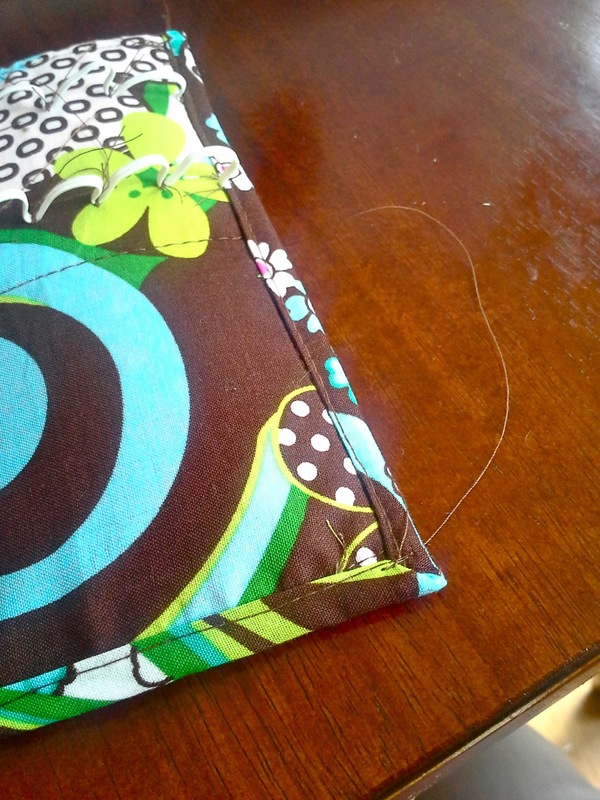 and lets just go from there: (umm also sewing machine and thread? Okay okay, you got it). 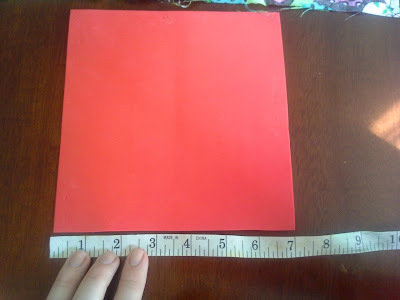 Cut your foam to a 7 inch by 7 inch square. 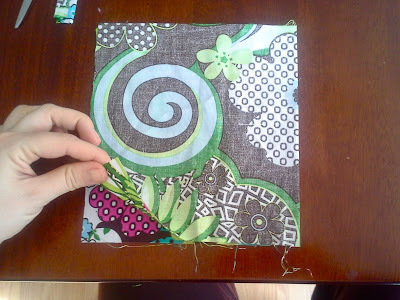 Cut your fabric to a 15.5 by 8.5 rectangle. Fold your fabric in half so it's basically a square and then iron that seam. Now you have two sides. 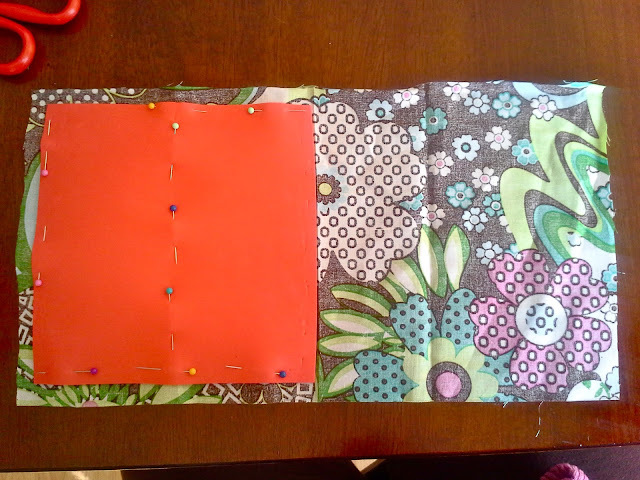 One side will be the INSIDE and one the OUTSIDE. The inside where the oils will be and the outside that's visible when it's closed. the center of that one side-so there's about a 1/2" edge around the foam square). 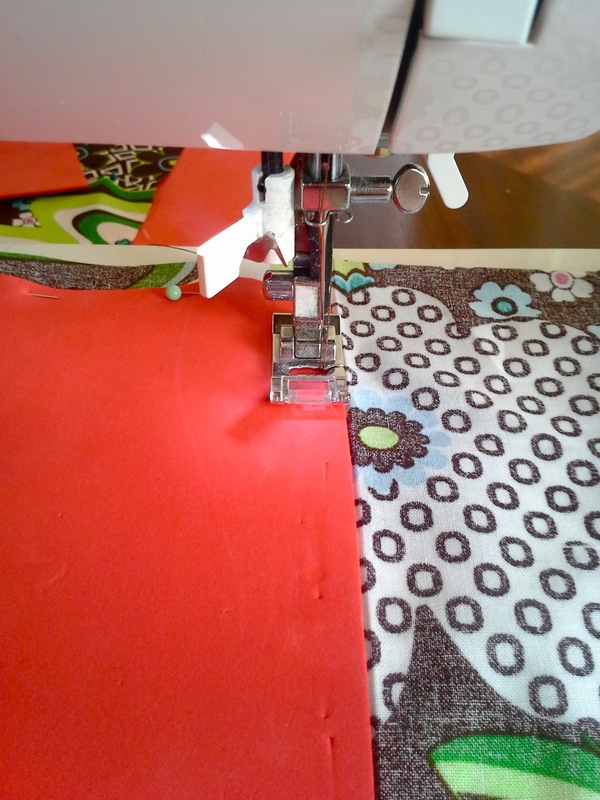 Pin it like so: Don't pin the edge of the foam that's lined up with the ironed seam. Now sew the unpinned edge of foam (thats against the ironed seam). When sewing any edges, get it pretty close to the edge and remember to keep it the same distance every time you sew edges here. 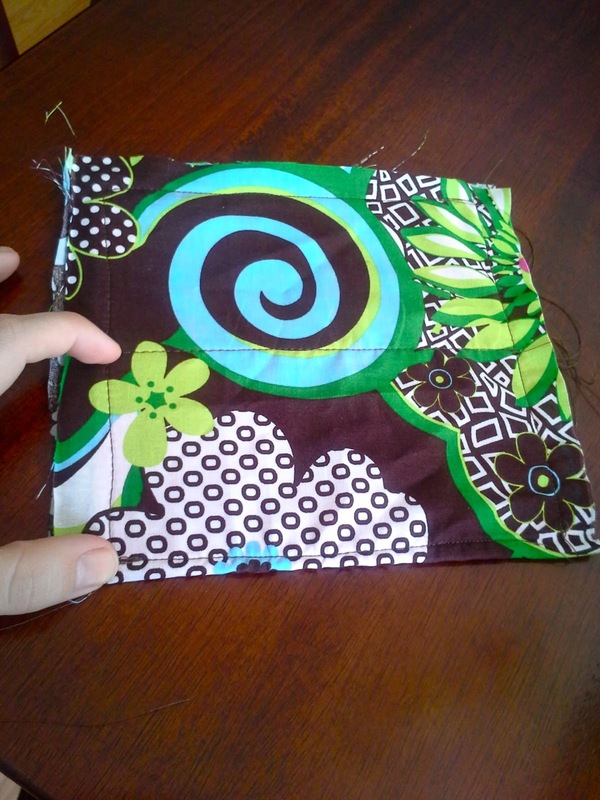 Now sew the other three sides of the square keeping the fabric pinned and taunt. 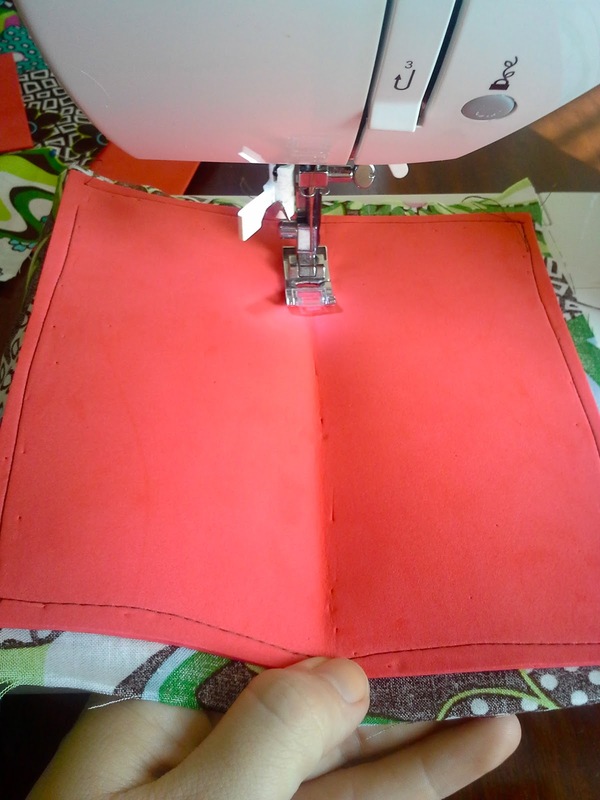 Then fold the foam in half really hard so there's a visible line. 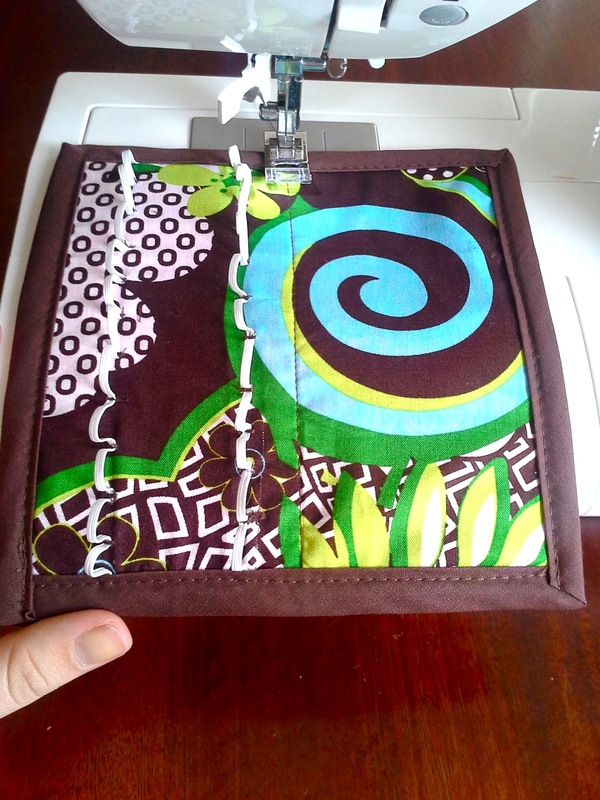 Now sew down that line. THIS IS NOW OUR CENTER LINE. 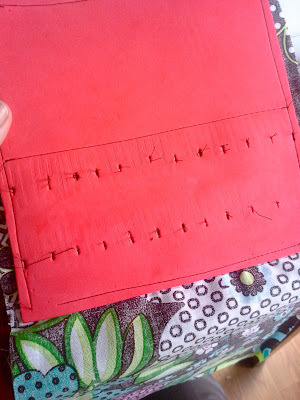 I flipped it over BELOW so you can see the sewn square and the CENTER LINE down the middle. Now you pick one of the two sides of the foam to be where the oil bottles will go. I picked the oils to go on the section where my fingers are because I love the fun blue swirl and I don't want to cover it up with the oil bottles. 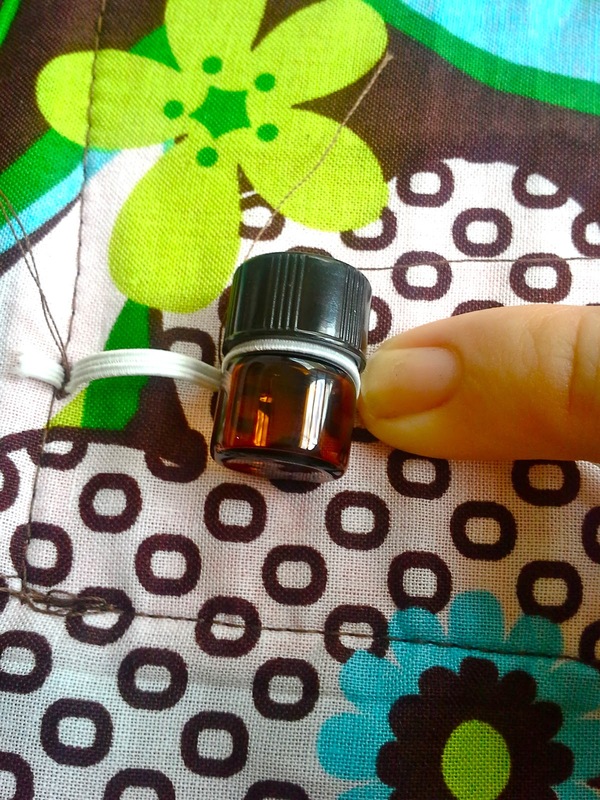 Either side can hold the oils but remember that you want the top of the lids to face that CENTER LINE. 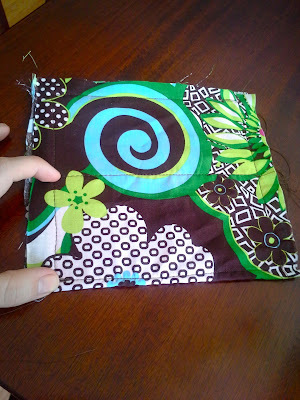 Maybe it will be easier to show you when I fold the fabric under where it is going to go. 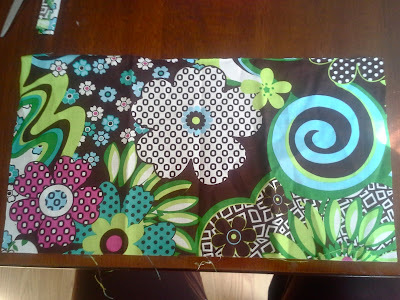 (if your fabric is an even pattern you don't even have to worry about this I guess but I'm going to put the oils on this white flower side and make sure the lids face the CENTER LINE). 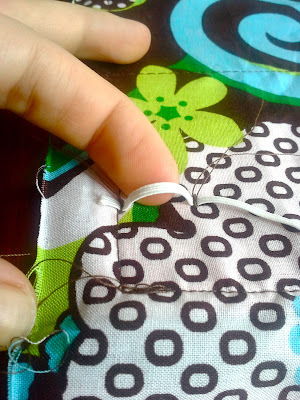 sew the elastic to the left side stitch. Now place your bottle there and wrap around/under the closed lid. press the elastic down. 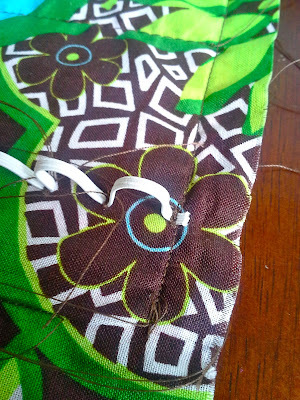 and sew the elastic there too. DON'T MAKE IT WAY TIGHT. It will hold it there without it being stretched much, just barely a little stretch given. It's better to have it not stretchy than too stretched and tight. YAY! FIRST LOOP IS DONE! Place the bottle and do it again. 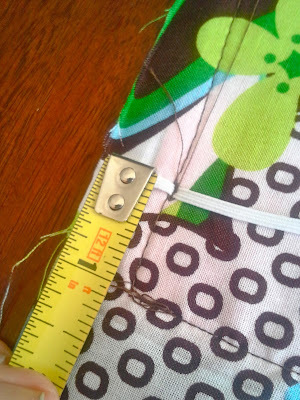 If you need to get a ruler out and make sure it's always an inch above the bottom stitch, it might help. When you get to the end, plan on 11 loops. 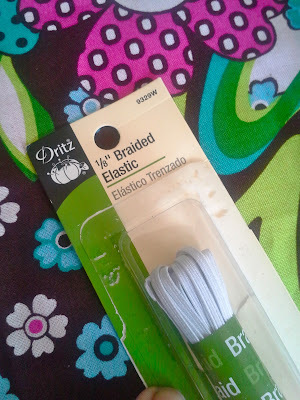 Then cut off the excess elastic. NOW do the top row of loops. REMEMBER that the lids come above the loops so make room for the bottles and lids. See the back of the foam? That's why we haven't folded over the fabric yet, we didn't want this showing. 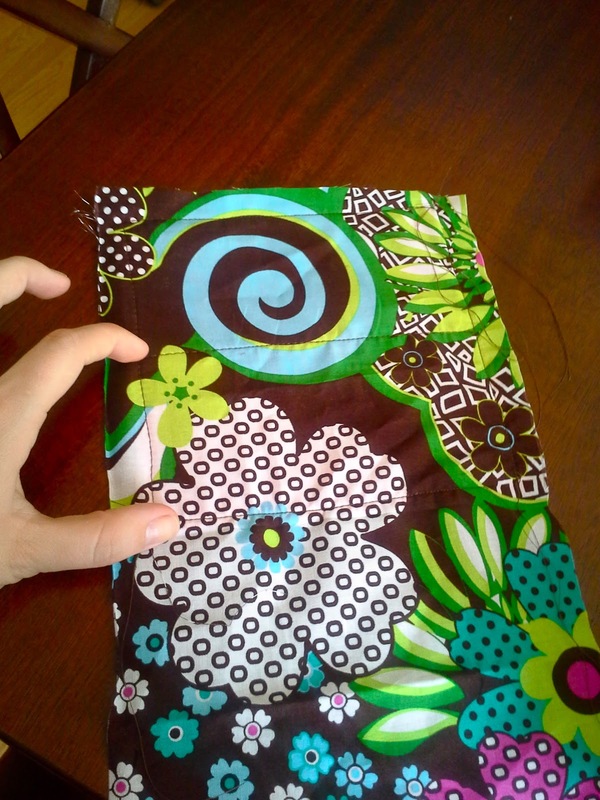 NOW you can fold the fabric over and pull it a little taunt and pin it and double seam sew all around the 3 edges. CHOICE: I took large double folded bias tape and made a nice edge all around it! It really polishes it up, but make sure to NOT sew the loops on accident into the bias tape...(did it obviously). 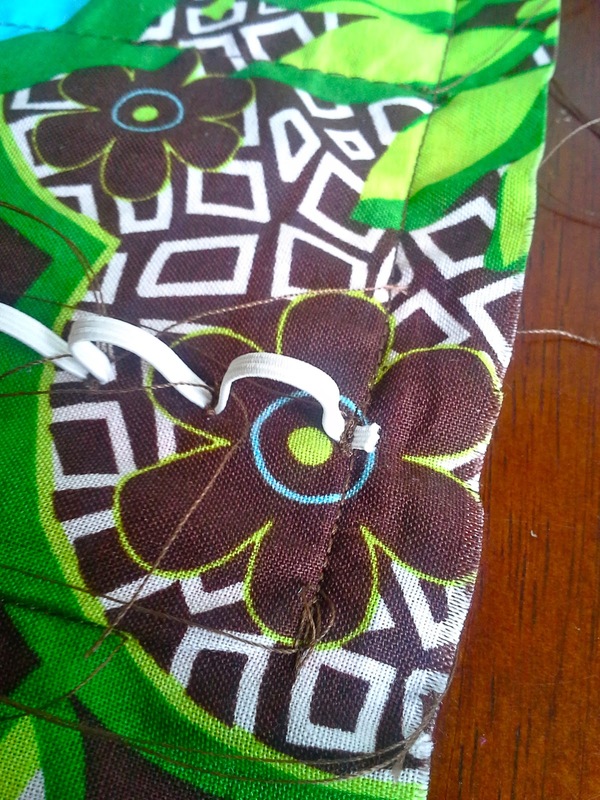 Then I found my CENTER LINE and sewed down it one last time to help with the fold of the case. Close it how you want it! 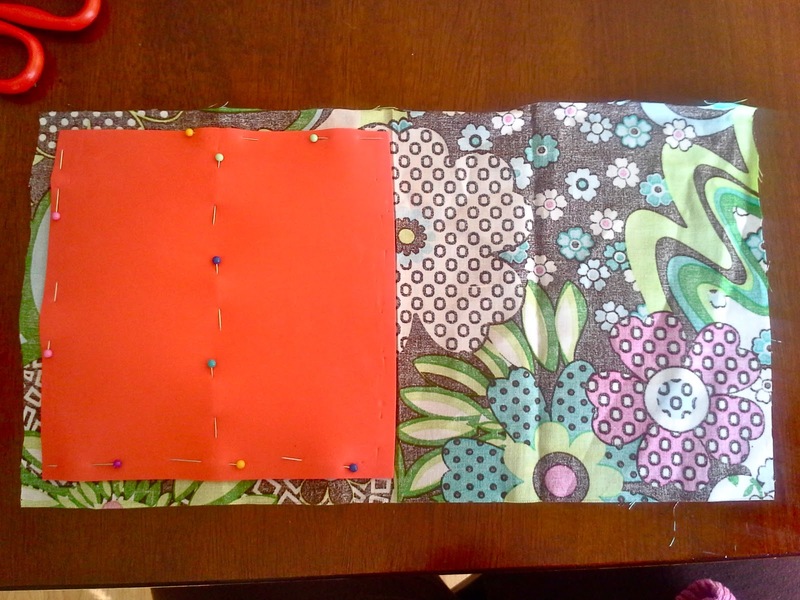 With bows, or a button! Awesome tutorial! I love this idea. 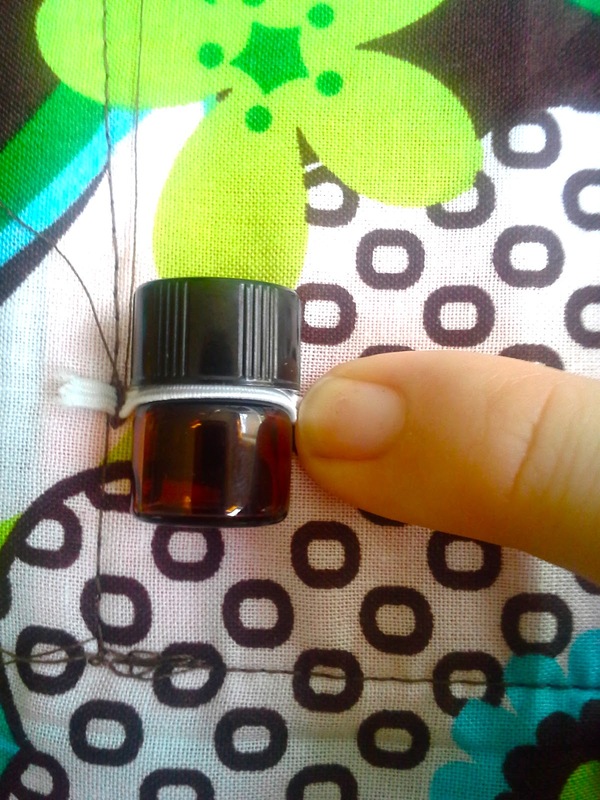 Thanks for the link to buy the small bottles too. Just curious....Do you sell these minus the bottles? Awesome!!! 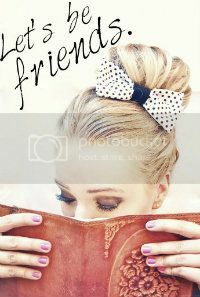 Just want I needed! Thank you for sharing! Just what I needed! I made one in about an hour! I may make several for some oily friends~thank you so much, the directions were very easy to follow! So clever! Thanks for the fabulous tutorial! !